Gluten-free highly digestible food, developed and produced in cooperation with veterinarians. 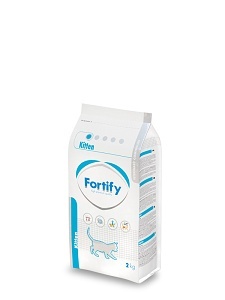 Intended for 1 - 12 month old kittens as well as for gravid and lactating cats. The food provides high level of nutrients and energy, ensuring thus optimal skeleton development and growth of your kitten. Nutritionally balanced food has been created based on the latest scientific knowledge as a full nourishment for kittens focusing on prevention of allergic diseases. The compound formula fully meets specific requirements for kittens. poultry meal (33 %), rice, poultry fat, fish meal, maize gluten, potato protein, flaxseed, maize, vegetable fiber, fish fat, fructooligosacharides (FOS), mannanoligosacharides (MOS), taurine, complementary substances, lysine, methionine, sodium chloride. protein 38 %, fat 21 %, crude ash 7 %, crude fiber 2,5 %, Ca 1,25 %, P 1 %, Na 0,25 %. Vitamins: vitamin A (E672) 18 000 UI, vitamin D3 (E671) 1 800 UI, vitamin E (in as alphatocoferol) 175 mg, taurine 1 500 mg, biotin 3 mg.Trace elements:Cu in form CuSO4.5H2O (E4) 13 mg, Zn in form of zinc and amino acids n-hydrate chelates (3b6.10) 78 mg, Fe in form FeSO3 (E1) 155 mg, I in the form of KI (E2) 1,5 mg, Se in the form of selenomethionine produced by Saccharomyces cerevisiae(3b8.12) 0,3 mg, Co in form CoSO4.7H2O (E3) 0,25 mg. Amino acids: (3.2.3.) L-lysine monohydrochloride 18 g, (3.1.1.) DL-methionine 6,8 g.